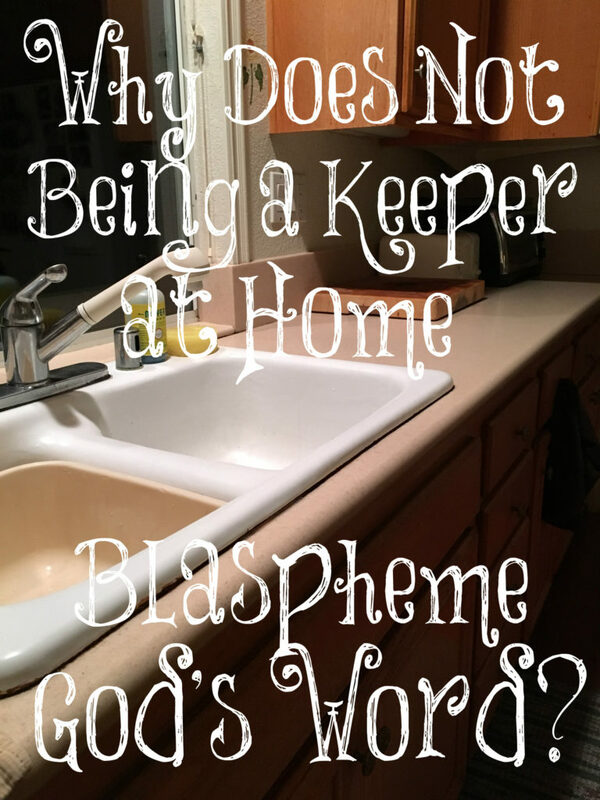 Why Does Not Being a Keeper at Home Blaspheme God’s Word? Younger women are commanded to be “keepers at home” in Titus 2:5 so they won’t “blaspheme the Word of God.” Many times when I am writing a post such as this one, I will go to biblehub.com and read all of the commentaries of old on the verse that I am studying. I love to learn from these godly, old men who weren’t swayed by feminism and the age in which we live. So I am going to pull out some of their words of wisdom for this important post since if you love Jesus Christ, you don’t want to do anything to blaspheme (speak evil against) His Word. We want to live lives that bring glory to the Lord and will draw others towards Him by the way we live our lives instead of away because of our hypocrisy (not obeying the Word. “As ‘guardians of the house,’ as the Greek expresses. The oldest manuscripts read, ‘Workers at home’: active in household duties.” The opposite of this (blaspheme the Word) would be to not be home often due to having a job outside of the home or running here and there so a woman is not guarding what is coming into her home, what her children are reading, seeing, and hearing, and what influences are affecting them. This is our God-ordained role, women. We are to guard our homes from evil influences and work hard in the home, not allowing it to become a pigsty. “House-wives, not spending their time in gadding abroad, but in looking to the affairs of their own families.” Women today can be described clearly as blaspheming the Word of God by the discontent they show when being home so they get involved in women’s Bible studies, retreats, shopping, etc. and don’t look over the affairs of their home and families. Few have time to fix nourishing and healthy foods for their families, spend time training their children towards godliness, and making sure the home is clean and tidy. Learn to enjoy being home and content where the Lord wants you to be. “This is said in opposition to what women are prone unto. It is reckoned among the properties of women, by the Jews, that they are ‘gadders abroad’.” It breaks my heart when I hear of women not “feeling fulfilled” at home training, caring, and disciplining their children so they go out and get a job then others raise their children. Yes, getting a job outside of the home away from the children is gadding abroad. It is blaspheming the Word of God. How can a woman expect to raise godly offspring if she is not around to raise and teach her children the ways of the Lord? We are called to continually speak to and train our children which way they are supposed to go. “For there is nothing more beautiful for a woman, than to abide in the corner of her house; for so it is written, Psalm 45:13 ‘the king’s daughter is all glorious within’.” Feminism has taken the feminine out of women. A woman at home cooking, cleaning, and caring for her children is feminine and beautiful. There’s nothing with more feminine beauty than a mother with her children in contrast to a woman in a business suit with a briefcase. Feminism blasphemes God’s Word and femininity brings glory to Him. “And this they say is what is meant by the woman’s being an helpmeet for man, that while he is abroad about his business, she is , ‘sitting at home’, and keeping his house; and this they observe is the glory and honour of the woman.” When you are out and about and not caring for your home and family, you are not bringing glory to your husband because the state of your home and the behavior of your children are a reflection not only of the Lord but of your husband. Raising children is time consuming and requires a full-time mother at home. Be this woman. “The mistress of the house is to add to her thrift, energy, and strict discipline, benign, gracious, heartily kind demeanor.” A woman blasphemes the Word by spending too much money, being lazy in her home and seeking her pleasures instead of the Lord’s, being selfish, and giving into her emotions and feelings. Be wise with the money your husband makes. Live contentedly within his income. Discipline yourself for the purposes of godliness remembering that His Spirit works mightily within you. Be generous with your time and money and be kind. Stop yelling at your children and train them instead; for this is good. “Stayers at home.” Be a stayer at home. Home is where God has placed you. Home is where you are a help meet to your precious husband and children. Make your home a sanctuary for your family. Put a lot less miles on your car and more miles on your feet and hands. Work hard at home and bring the Lord glory as well as your husband. Make their lives as good as you can by disciplining your flesh and learning to be a living sacrifice; for this pleases the Lord. What will it profit you if you gain name recognition, a career, make a lot of money, own a big home, but lose your children’s souls? Relieve Your Mind of Worry! I need some help in this area. I’m a young homemaker without kids (not for lack of trying, unfortunately) in an area where none of the other ladies stay home. That means a lot of the time, I end up alone all day while my husband is at work. Is there something I can do about this so I’m not blaspheming God’s word but I’m also not spending a majority of my day alone? I thought church involvement was a good solution until you mentioned women’s bible studies etc in your post, now I don’t know what the solution is. Please help? If you don’t have children yet, Taylor, yes, get involved in your church and minister to the young mothers, older women, or whoever is in need of help as long as you are taking care of your home responsibilities and husband. The problem I have with most women’s Bible studies are that they are not teaching what God specifically commands women to teach women (godly womanhood) but are using materials from women preachers/teachers that aren’t completely biblically accurate. Some of them are, yes, but a lot of them are not. But you can go and be a light to these women since you know and understand what being a godly woman looks like! Ask the Lord for wisdom in how to use your time wisely and to put people into your path that you can help. Thank you for the advice, Lori. Until children come along my home responsibilities are pretty simple, so I think I’ll continue looking for church activities in the mean time. I agree with Taylor. What can we do to meet the needs of loneliness? Does a women’s bible study during the day hurt if it doesn’t interfere with her duties as a wife? I would like your take on this. No, it doesn’t, Melinda, but as I said in the comment above, most Women’s Bible Studies don’t teach women godly womanhood, unfortunately, but since you do know it, God may be able to use you in the study to speak the truth in love concerning God’s will for women. Beth Moore’s teachings don’t excite me. I wouldn’t learn under them anymore. Martha Peace is great. It’s too bad Women’s Bible Studies don’t use books like hers or Ann Ortlund, Debi Pearl, or other older women who teach godly womanhood since this is what most women need. First of all, have you asked your husbands if they are pleased with your efforts in the home? Have you asked them if there is anything additional that they would like to see done, done better, or done differently. Have you asked them if they have a preference on how you spend your free time? Have you expressed your concerns to them and asked them to help you come up with constructive ways to use that time? This should be your first step and then comply fully with their wishes. If they do not have a preference and leave it up to you, then ask yourself this. What did the Proverbs 31 woman do with her free time? How did she handle her loneliness? Trick question? Yea, she didn’t really have any free time to be lonely did she? Her time, that started early in the morning before the rest of her household and ended late at night, was spent doing constructive, beneficial and profitable WORK that benefited her household and brought good and honor to her husband. It also brought honor, praise, value and blessing upon herself. I think one of the tragedies of this modern era where women have so many modern machines, conveniences, and stores to shop in, is that they have way too much free time and way too many of them sit around idle and waste the time they are given (being lonely), or try and use it up in useless (socializing) and other (playing games on phones or computers) wasteful ways. Far too many women also use the time they have so inefficiently that it brings shame to their hard working husbands. Instead of growing their own food for their family, they use the money that their husbands earn to purchase it. Many women purchase food that is as processed and already made up as possible to further reduce their time spent working in the kitchen. Instead of growing the flax and cotton that is needed to make the fabric and then making the clothes that their family needs and possibly selling some to others, they use the money that their husbands earn to purchase their clothes and instead of mending something when it gets a hole, they just toss it and buy new replacements. Whereas in decades and centuries past where the woman worked hard all day long at doing these types of beneficial household activities and ended up contributing so much more to the overall support of the household, now days, especially for the stay at home wife/mom, EVERYTHING is left to the husband to earn and provide for while the wives sit at home idle, suffering with loneliness and complaining that their husbands work too many hours. Is this really Gods plan for a Christian wife that she has so little to do in her home that her biggest problem in life is dealing with loneliness while her husband carries the load virtually all by himself and his reward is a nagging and complaining wife because he works too much? Please don’t misunderstand me, I am not in any way suggesting that women go and work outside the home (unless that is what their husband instructs them to do). The Bible clearly teaches that a woman’s place is IN the home but ladies, those verses in Proverbs 31 weren’t put there for no reason! Just because you can go (drive) to the local grocery store and purchase an already put together lasagna in a box ready to slide into your electric oven to cook for your family, does not mean that is what you should be doing. You should purchase (or grow) the raw ingredients of a quality that is the best value (quality vs cost) and make as much of the food your family eats as possible from scratch. Women you need to learn to cook and do it well and teach your daughters these skills also as part of their home school curriculum. Done right, this will take some time but it is time well spent. Do you have room for a vegetable garden in your back yard? Flower beds? Pots on your porch? Then as long as your husband is OK with it, grow as many of the vegetables that your family eats as you are able. Learn to can and put extras up if possible. Include these skills for your daughters in your home school curriculum. Time well spent. Do you still have extra time? Can you make clothes for yourself, your kids, to sell to others? Forget the flax and cotton as that would not be an inefficient use of your time but purchase fabric from the store and make some clothes or bed sheets. If you don’t know how then use the internet for something useful and learn. Then you can teach your daughters this skill too (as part of your home school curriculum) and prepare them to be a Proverbs 31 wife to their future husbands. Time well spent. Still have extra time or unable to garden or sew? Then, figure out what small part-time business that you can open out of your home (with your husbands approval) to bring in some extra money. That is what the Proverbs 31 woman did and it was… time well spent. Here is the bottom line regarding your free time; prioritize your efforts (allowing your husband the final say) and continue to focus on these types of beneficial activities until your free time is all being constructively and beneficially used up. Spend time with the Lord in song and worship while you work. Your fellowship with the Lord and the sense of accomplishment that you will get from the constructive work will drive loneliness far from you and there will be other rewards for… time well spent. Let’s face it ladies, 90% (or more) of the activities for women at the church INCLUDING women’s bible studies are just social events and are really just a WASTE of time. Do you want to spend 1-2 hours a week cleaning the bathrooms or vacuuming the floors at your local church? This would be time well spent but going up there to socialize and gossip with other women? No so much. I am not saying that you should NEVER attend a function like this to socialize or never have lunch with another Christian woman, etc… but time spent this way should be considered a luxury and kept to a reasonable minimum. The Bible has given you a model in Proverbs 31 of what a Godly, virtuous wife should be and that is the scripture you should be meditating on when you are trying to figure out how to spend the free time given to you by your husband and the Lord. A word of caution; be very careful going out on the internet and/or talking to other women to see how they have interpreted Proverbs 31 and what they are doing because there is a LOT more wrong out there than what is right. Read Proverbs 31 in the Bible for yourself. Read it over and over until you have it memorized and then meditate on it for as many hours, days or weeks as it takes while praying to God and asking Him to show you what He wants you to do with the time that you have been given. Then, when you think you have an answer, run it by your husband for his final approval and blessing. Thank you for this wonderful insight! 2) The Healing of the Church Starts With Women of God. *For the King’s name to be praised, princes will be made in all the earth. Women have “Favour” with His people if they stay “within” His “palace,” His house, His being, His word. In fact, His people are ‘entreating’ women, pleading with women, to do this. And, ‘The King greatly desires thy beauty’ …, He desires this living ‘within’ His palace. Give Him His desire! I attest: women of God are stunningly beautiful, creating crumple-over breathlessness in me when I see it. I suggest that God has a feeling like that, for He desires thy beauty, and has created that image [character] of Him in men. Note that these daughters bring other virgins with them to the King, into / within the palace, encouraging them as in Titus 2. Women are incredibly powerful, but not in the way the world has sold to them [and sadly even the church sold to them]. Women hold the key to the healing in the church, by surrendering within the palace of the King, by surrendering to the King as the Word, so that He is not blasphemed. Only then will His men come to life as ‘princes in all the earth’ and lead His people to prepare for the joyous coming persecution God has waiting for His people, that we may know Him and His name be glorified. I pray your wife becomes beautiful to you one day for true beauty radiates from within. Our outer shell that is decaying can only cover up so much disgraceful behavior. There are other places that mention blaspheming His Word like in 1 Timothy 6:1 speaking about servants treating their masters worthy “that the name of God and his doctrine be not blasphemed” and I think there may be a few other places. I believe anyone who lives in disobedience to God’s Word and calls themselves a Christian is blaspheming His Word. No, very specifically that the “WORD” OF GOD BE NOT BLASPHEMED. The “Word” of God is JESUS. I know of no other place in scripture that speaks of Jesus being blasphemed. God yes.. Holy Spirit yes. But Jesus no. That states to me that the only ones that can blasphemy JESUS are women, and that makes sense in that marriage models respect, submission and obedience to Jesus. Others can speak a false message to women (the opposite of “that the Word be not blasphemed”) but women do the the blaspheming of JESUS . THE CHURCH MUST RECKON WITH ThIS SCRIPTURE. frankly, it does not. I say you Lori are the ‘most’ because you are actively challenging many, putting your life on the line. Sure, there are a few women that model submission to a handful around them — and that is what is needed in the church — but few will be discomforted with persecution doing it. Not to worry about me and my marriage. The Lord has us in this place for a reason. We don’t walk in the spirit unless we are in dispare of ourselves. No cross, no Jesus. I venture to say there are few on earth who have spent more time talking to God and searching scripture the last 3 years than me including up hours in the middle of most every night having spend maybe 6-7000 hours studying and writing about the condition of the church and marriage. There are major changes coming for those that don’t simply say “Lord, Lord” …for those that will know and be known …all so the Lord is glorified. I agree, Dave. It’s a scary place to be for many who call Him LORD but fail to do as He says. Yes, it’s not always comfortable teaching the Truth of God’s Word to women but there is great reward. Nothing worth having comes without a price but to me, it is so worth it. Jesus is specifically identified as the “Logos” [in Titus 2] and that is God sending His Son to the earth in the flesh and that is incredibly special and that ‘who’ is what is being blasphemed, the BEING of Christ; God on earth as living and emotional and being infinitely intimate. Doctrine, precepts [principles] are mentioned throughout Scripture, but the Word IS scripture and a BEING and it is Jesus. The church is one with Christ and marriage models that. And Jesus, as groom to His bride, taught the doctrine and precepts that were of Himself, but also asks and demands of His bride that she be personal with HIM, with His very being. Martha was busy living out His doctrine while Mary was living out the personable HIM, His very being. There is a difference; masters and servants are not intimate [1 Tim 6:1]; Christ and the church are intimate, and husband and wife are, and I believe this relates to the “mystery” that Paul speaks of about marriage. The mystery does not exist if a wife blasphemes the Word of Titus 2:5 [and the intimate being of her husband, God’s representative here on earth] for it models that blasphemy for the church, and then the church is not living the ‘mystery’ with Christ. Again, it was/IS very special of God to send His Son to earth IN PERSON; and He is not just ‘doctrine’; that Word, that ‘Logos’, it is the full and personal life of our Lord Jesus. There are several “Ladies’ Days” during the year that our church is invited to attend. These usually are on a Saturday morning for about 4 hours and I would say there are probably 5 throughout the region. They usually have a speaker and a bit of singing and serve lunch. The speakers are all a part of the fellowship that has only male leadership so no men are present in these as women do not lead men in worship. I have recently thought about attending them again (I used to before I had children). What are your thoughts? Thank you also Lori for responding to my e-mail about teaching girls about puberty. Just make sure that you pay attention to what these women are teaching and that they line up with the Word. I go to a Women’s Retreat for one day that is given by a godly, older friend of mine. She mostly gives stories that have happened in her life, speaks about her love for Jesus, and adds in a lot of Bible verses. It’s a sweet time of fellowship for all of us and her husband is present but he is the only one . Thank you, Lori, for this post. It is one of the many posts I enjoy reading because it exemplifies true femininity according to the word of God. I just recently became a stay at home mother and I just began homeschooling my husbands and my only daughter. I quit my full time job and my husband has more time to pursue his business. Last year was so difficult because my husband had to sacrifice many missed opportunities because of my job and because we refused to even put our daughter into daycare. She was looked after most by him, or after his mother or lastly and sadly me as I was gone for so many hours out if the day. But God is GOOD and now all that is changed. I have a LOT of work to do at home, most importantly raising our little girl in femininity, and fear and admonition of the Lord, and setting our home to run on a clean and organized schedule. This was the first week I completely fixed all the meals myself with little help from my husband and even though some didn’t turn out exactly the way I envisioned my husband sat and ate everything with a great big smile, even my mushy chicken and rice ?. Thank you again for “teaching the younger women”. 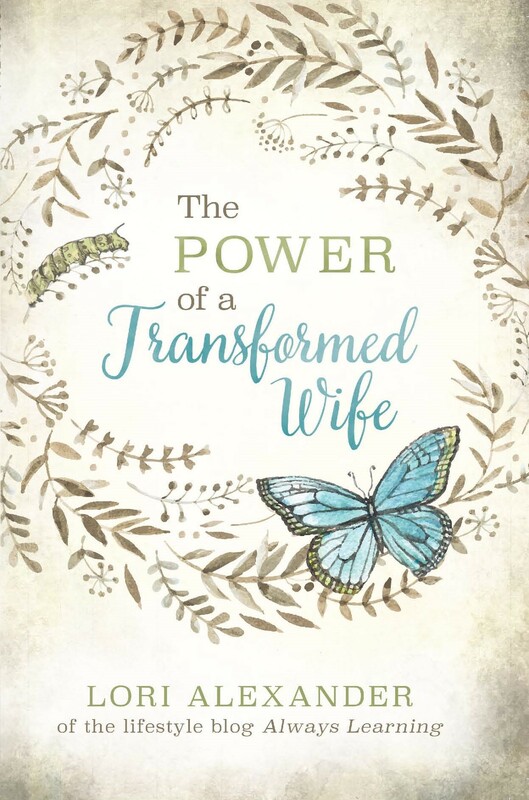 Between your blog and Debi Pearls ” Created to be His Helpmeet” (which I could not put down and devoured during my work lunch breaks), I am a changed woman, shunning feminism and seeking after being a servant to Christ through the needs of my family. Be blessed! Your family is blessed, Kasey, because you have a soft and teachable heart to the truth of God’s Word. You will love fulfilling your God-ordained role. I’m so happy for you! Such a great article! My husband and I prayerfully decided my role is in the home and not in the workplace… and what a difference it has made! One important thing to add is that this was to be taught from and by the older women. And it’s really important to note that teaching affectionate love for husbands and children were the first mentioned. Having years of experience now, I know that my husband and children will take my affectionate love over well swept floors. There is truly a balance in all this and it will be your love growing or increasing that will transform into fruit. It must be sought above all else because it will satisfy you the most. Please address the matter of “older women” being at home. I am 49 and my 5 children are all grown and out of the home. I have alot of free time on my hands. My husband is more than happy with my job of taking care of him and our home. He even encourages me to teach at our Christian school. I do enjoy it but feel a longing to be “home” …filling my days with “wifey” things. What does the Scripture say about older women leaving the home for ministry work? Wow! We are in the midst of making the decision if I should continue working when my daughter is born in a couple months or if I stay home full time. I work for a ministry now. And it’s been such a huge decision between financially and just what’s best. But after reading this and knowing that my husband really would prefer me home. And I believe that is what God would want I believe God has shown I need to be in the home!